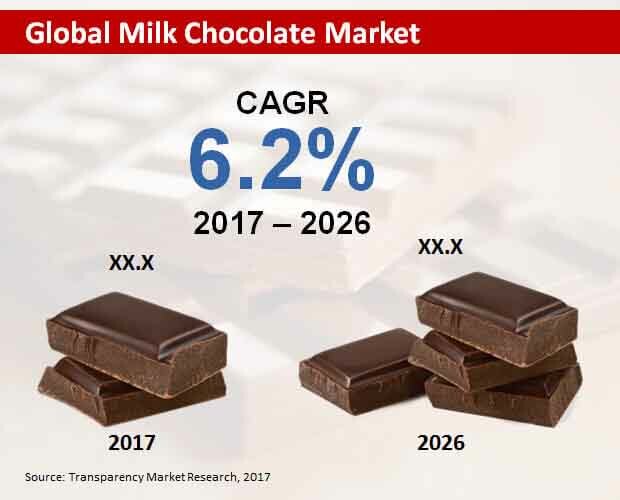 The global milk chocolate market features an increasingly dynamic competitive landscape, attributable to constantly changing taste of consumers, and the presence of several large players. Transparency Market Research (TMR) notes that several key producers are experimenting with new formulations in their product developments, in order to gain competitive edge over their peers. Some of the top players operating in the global milk chocolate market are Chocoladefabriken Lindt & Sprüngli AG, Chocolatiers (UK) Ltd., Nestlé S.A., Barry Callebaut, Unilever, and Ferrero SpA. Prominent producers are also focusing on innovative production techniques, with an aim to consolidate their positions in the global milk chocolate market. On the geographical front, Europe is by far the most lucrative region in the global milk chocolate market. This is attributed to the extensive popularity of dairy-based chocolates in dietary patterns of the regional population. A large chunk of revenues of the regional market for milk chocolate will come from countries such as France and Germany. Among the two broad product types, conventional milk chocolates are anticipated to garner higher demand as they have been considered more delectable among consumers in the milk chocolate market. However, organic milk chocolate is likely to gather steam over the years, owing to less processing the products undergo. The global milk chocolate market is projected to garner a CAGR of 6.2% during 2017–2026. The global milk chocolate market growth dynamic is increasingly influenced by changing taste and dietary patterns of consumers across the world. The rising demand for a large variety of chocolate flavors that can meet the taste preferences of consumers across a wide geographical locations is a key trend propelling the growth of the market. The efforts of producers to develop indulgent delicious milk chocolates for a wide consumer base is also accentuating the growth. The introduction of multiple flavors in milk chocolates has helped in attracting new consumers in developing economies and also garner more sales in developed markets. However, producers are preferring to go for standardization of milk chocolate formulae, which may make the entry of new players in the milk chocolate market increasingly difficult. Over the years, this is likely to raise the ante for emerging players in the global market. Nonetheless, such product developments are expected to benefit consumers at large, since this will lead to the reduction of milk fat in various milk chocolate products. Such strategic moves by prominent producers of milk chocolates will improve the safety profile of newly developed products. However, the prospects of the milk chocolate market are hampered by the chocolates made with minimal processing that alters the taste of end products. This is found especially in organic products. Nevertheless, the addition of ingredients such as chocolate liquor, cocoa butter, lecithin, and milk solids is opening exciting frontiers in the market.